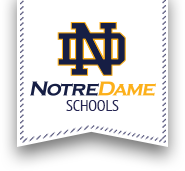 Notre Dame Elementary is a Pre-K through sixth grade school. Our focus is a faith based education where all faiths are welcome. Our school was founded in 2009 with the merger of three Catholic schools in the greater Utica area. Our teachers are experienced in their areas of instruction and have a desire to ensure that all students become lifelong learners. Three Pre-K programs are offered: Universal Pre-K, modified Montessori, and a traditional theme based program. Our Kindergarten through six program is based on the New York State Core Standards and the Interdiocesan curriculum goals established by the Archdiocese of New York. New York State tests are administered to students in grades three through six and our passing rate meets or exceeds our neighboring school districts. A variety of extracurricular programs are offered including; Band Bus, foreign language, technology, and athletics. Founded in 2009 and inspired by more than a century of Catholic education in the Greater Utica area, Notre Dame Elementary School is committed to Catholic values, educational excellence, and community service. Welcoming families of all faiths, Notre Dame Elementary seeks to create a safe and nurturing environment in which our students are challenged and encouraged to follow the example of Jesus Christ, achieve academic success, and reach their God-given potential. Dedicated to Our Lady, who brought the child Christ to the world, Notre Dame Elementary supports the ministry of our local parishes and the universal Church by teaching Catholic values, encouraging virtue, and forming students in faith for service to community and Church.